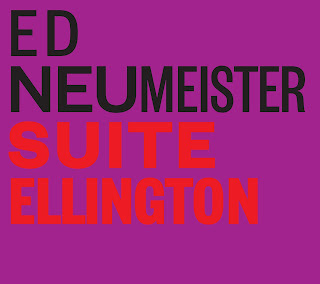 Ed Neumeister’s profile is the result of long and deep experience. As a performer he has been at the forefront of Jazz for more than 40 years developing a unique voice. 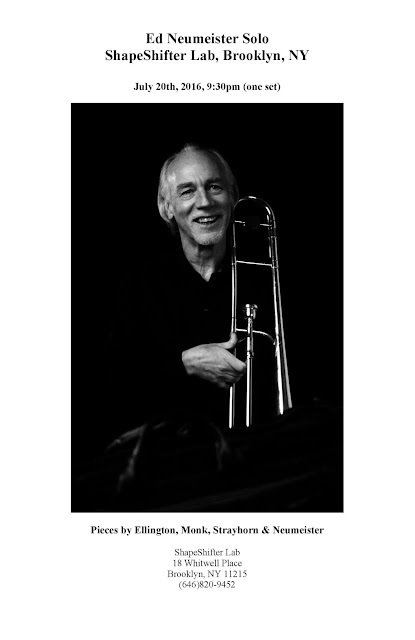 Having also worked with high level classical orchestras and ensembles nurtured his focus on conducting and composing. He knows what the musicians need because he was there. How does one prepare for a solo concert, when a big part of the music is improvised? If one has been performing mock solo concerts for years, you don't prepare - you are always prepared. "Practice" Sessions, for me, are opportunities to perform. Every session is a performance, and not necessarily a preparation for a performance, but really a performance, even though there might not be an actual live audience there. An imaginary audience is always possible. Still.... preparing for a real "public" solo performance or recording requires a certain advance planing: length of program, number of pieces, relative number of improvised pieces to composed pieces, etc. You know, when one is as strong and secure as possible, then, when playing with others, we can actually elevate the other players and allow them to feel secure and confident that they can trust the musical moment and be free to interact, groove, respond, freakout, whatever the music desires. Even though, I would love to perform a complete improvised program, I also love playing beautiful melodies and expressing myself through the melodies of master composers like Thelonious Monk, Duke Ellington and Billy Strayhorn. So, why not mix and match? Regarding forms for the improvised pieces, I usually decide on-the-spot, from a group of forms, feelings, emotions, vibes, tempos etc., from the pieces that I have already improvised and or composed and cataloged. There are several "vibes" that we can choose from, like different tempos, vibrato, plunger, and others. And then, utilizing the composers perspective......compose something (with the chosen vibe) on the spot. Fun!! Like almost everything else in life, the more you do it, the better it gets. If you are in New York tomorrow July 20th, come join me for my solo performance at ShapeShifter Lab in Brooklyn at 9:30PM. With all do respect to recording and mastering engineers, for various reasons, I’ve elected to take on these tasks myself whenever possible. I really enjoy editing and mixing my own recordings. When I’m not actually editing and mixing projects myself, I’m usually either in the booth with the engineer or making detailed notes about the edits and mixes, or both. I’ve edited and mixed several CDs plus many projects for film and TV and other media. It’s normal for a composer working on movie, video and TV projects to do their own mixing and mastering depending on the size and scope of the project. For smaller budget (or no budget) projects the composer is often the only warm body in the room, taking care of performing, recording, editing, mixing and mastering. Then sending the finished master to the director, producer or editor. In classical, jazz and other acoustic recording situations, it’s more common to hire a studio, mixing and mastering engineer. I can tell you from experience it is a great pleasure working with top-level pros who really know what they are doing and are able to do it fast, because, the clock is ticking. Many successful movie and TV composers have a decent size recording studio at their house, saving them the time to travel back and forth to the studio plus all the costs involved with hiring a studio for the day. The substantial investment to set up a home studio will, for a working composer save money in the long run and give the composer the flexibility to work on the project as needed, which can mean around the clock with the deadline looming or with the freedom to work on the recording until it is “perfect”. With software becoming more and more sophisticated and easy to use, it’s not that difficult to learn to edit and mix with fluidity and confidence. The beauty, compared to the old days with tape and razor blade, is that the edits are non-destructive, so when it doesn’t work out we can simply start over again or backtrack. Of course, this work is time consuming, especially at the beginning, learning a new software. I find the best way to learn a new software is to go through the tutorials, there’s usually several to choose from. It normally takes about three hours. Almost always, three hours well worth spending. Normally there is a tutorial included with the software and now-a-days there are plenty of How-To books and videos, many for free on YouTube. Then, I like to jump directly into the project. Knowing that the mixing and editing is non-destructive we know we can, at any time, start again from scratch. Many times I’ve worked on a project the whole day only to throw it away the next day and start from scratch. It’s always faster and better the second or even third time around. Go figure…. Depending on the deadline, the beauty of mixing at the home studio is that we can take our time working on the project. Working a day, sleep on it. Refining and polishing further the next day. We can also make a few different versions to compare and decide later. We have the luxury of putting it away and coming back to it in a few days, or weeks. Of course, it’s good to know, as much as possible, about what we are doing. I read a few books on the subject and check out several how-to videos, sometimes coming back to a chapter when I have questions about how to do something specific. The bottom line is it’s not rocket science. We want to make it sound as good as possible, so it’s a mater of blending the musicians together so that it sounds as close as possible to a live situation, or even better if that is possible. It’s a good idea to compare with other recordings from time to time so as not to loose perspective. Listen to recordings of similar music with a recorded sound that you think is great. Then emulate that sound, as much as possible. I was using four or five different recordings as a reference. It’s amazing how much they can vary. I’ve had the benefit of working with top engineers, so by watching them and paying attention, trying to follow what they are doing and why. And, by asking questions, when appropriate, we can learn a lot. It’s amazing how much we can learn simply by paying attention. What a concept. Regardless, the mixing engineer’s job is to follow our direction, so in the end it is still us, the leader, composer, artist, producer that has to say: “OK, we got it, let’s move on”, or “give me some more trombones”. Suite Ellington was recorded live, so that involved issues that we, hopefully, don’t face in the clean studio environment. With a live recording, there is no “take 2,” unless we record several concerts (the most ideal). So, when something needs “fixing” we have to find a way beyond going to another take. I was fortunate with Suite Ellington as all the players are fantastic top-notch players, so there were very few mistakes to deal with and some very wonderful playing from all. The first decision was just to pick the best 60 minutes from a two-hour concert. And because there were sometimes several long solos on a particular tune (we were stretching out), it was necessary to cut out some solos and even to make some of the solos shorter. Decisions, decisions. On this latest Suite Ellington recording, I decided to also do the Mastering. Mastering is the one aspect that I always turned over to the Mastering engineer. A Mastering session used to be, and still is, a studio filled with stacks and stacks of hardware with lots of nobs for the engineer to tune and “fine tune” the frequencies. Looks like a kind of Mumbo-Jumbo, with the mad scientist “fixing” what is, hopefully, a pretty decent mix to begin with. In my Mastering research it became clear that the go-to book is from the Mastering Guru Bob Katz. His book is written for the layman and professional alike, clear and easy to understand. The main message is “When the mix is great, there is very little, if anything, to do in the Mastering process”. In former times the Mastering engineer made the recording louder, so that it could compete in volume with the other tracks being played on the radio. Katz called this the “loudness wars” and strongly recommended against falling into that trap. But for Jazz, Classical and other acoustic music the goal is to retain the dynamics and maybe polish the sound a little. I certainly believe that the sound of Suite Ellington recording was enhanced through the Mastering Process. The rest of the job of the Mastering Engineer is to put the spaces between the tracks and make sure all the tracks have the same relative volume and embed all the necessary codes and tracking numbers. Through this ongoing process I am learning a lot about the process of producing a recording as well as how instruments respond in the recording environment. The software allows me to experiment and continue refining and polishing until I am completely satisfied, or the deadline arrives. Whatever comes first, which is usually the deadline! Plus, we can save the money it costs to book studio and engineer time. Speaking of software: I am using Sibelius & Finale for notation, Logic Pro X for recording and mixing. I also use Pro Tools but feel more comfortable with Logic these days. For Mastering I use Ozone 6 from iZotope and HOFA CD-Burn & DDP to prepare to send to the Manufacturer. Hope that was a worthwhile read. Recording update and other news. It's been a busy time preparing for the upcoming NeuHat Ensemble recording. While in New York the past week I've been involved in a couple of very cool projects. Last night (Sunday) I performed in a chamber quartet setting with Dave Glasser (sax and flute), Bevan Manson (piano) and Joe Fitzgerald (bass) at the jazz club Smalls. Playing without drums brings out the transparency in the music. Last Thursday September 18, the Composers Collective "Improvisatory Minds" produced our first New York Concert, after 5 successful concerts in Los Angeles. The Performers were the The Righteous Girls (Gina Izzo – flute, Erika Dohi – piano), Susan May Schneider – voice, Alan Broadbent – piano, Bevan Manson - piano and myself on trombone. Composers were Billy Childs and IM regulars Bevan Manson, Mike Patterson and Gernot Wolfgang. The concert went well with an enthusiastic response from the audience, composers and performers alike. Looking ahead: Ive got a tour to South America coming up in November with concerts in Buenos Aires and Cordoba Argentina, Montevideo Uruguay and Sao Paulo Brazil. Please join me with the NeuHat Ensemble, if you haven't already and help to support creative music. Thanks! Back from Hell… no, not a gig….. Just came back from an unexpected and unplanned journey to Hell, or more specifically Lyme Disease (neuroborreliosis). The adventure began last July with a rash on my ankle. The doctor said it was probably nothing and gave me some cream to put on it and said come back if the rash doesn’t go away in a couple days. Unfortunately, it wasn’t a typical Lyme rash, which I already new about from living in Westchester County New York. The rash looked like it was fading at first, but then after a week it was clear it wasn’t going anywhere. Doctor #1 on vacation, so off to doctor #2. By now I was feeling a strange sensation above my left ribs. This doctor didn’t think it was anything and that the burning sensation in my rib area was probably a pinched nerve from playing tennis. He made a blood test to look for infections from ticks and other bugs etc, negative, I should just stretch some more. But the pain just kept getting worse. Fast forward a couple weeks the burning pain in my abdomen area got progressively worse making it impossible to sleep, so off to the emergency room, for some pain killers and more blood tests. Nothing, but needed to see an internist ASAP. Saw the doctor the next day. More extensive blood tests as the pain got increasingly heavy. This was a nerve pain, feeling something like an intense sunburn all around my abdomen, which made laying down painful on whatever area I was laying on. The only relief I could get was in the bathtub, so I took a bath every two hours. Pain medication wasn’t really working. After one more tortuous night and a pleading text message to my doctor for HELP! She called me into her office to tell me I had neuroborreliosis or Lyme Disease, the kind that affects the central nervous system. She basically checked me right into the hospital into the Neuro or brain unit. At this point I was in too much pain to pay much attention to my surroundings. Intravenous antibiotic and pain killers, but the pain medication did not really work and it totally messed up my stomach, so in addition to the nerve pain, I was dealing with some serious stomach pain. I Had it Bad and That Ain’t Good. The doctors said that two or three days of antibiotics and the pain will go away and I can get on with my life. Well…. Three days later, the pain is getting worse, I’m not able to sleep through the pain until I fall asleep out of exhaustion, up the whole night pacing the halls, in between showers (oh, the relief). Then, I started to lose movement in my right arm. Now, I couldn’t brush my teeth or feed myself with my right hand without help from the left. For a trombone player, that’s not too cool. But the doctors said I would make a full recovery and I believed them, so I wasn’t worried, too much. By this time, once it became clear that I would be there awhile, my wife brought my computer and my music manuscripts so that I could work. I was right in the middle of a film-scoring project, so I sat in the hospital bed, day and night, in between bouts of pain, and composed for the film. It’s great to have something positive to focus on at times like this. Occasionally, I would get inspired to compose more “creative” music, sometimes coming out of the delirium of pain and painkillers. Luckily, I had my trusty music notebook to transcribe and log my ideas. I must say I had one or two very creative inspirations there in the hospital. I’ll be following through on those ideas soon. Once I started paying attention to my surroundings, I felt like I was in a surreal “One Flew Over the Cuckoo’s Nest” setting. Remember this is the brain unit. There was the guy with a big scar all across his forehead watching TV in the TV room all day. The guy across from me was clearly “crazy”. No, that’s not nice. He was quite nice but clearly had some issues (who doesn’t right?). My other roommate was dying from an ear infection that spread to his inner organs. Wow, we don’t think of these things unless we are confronted directly. Eye opening. I met a very nice woman who was a lawyer. She had Parkinson’s disease. She couldn’t control the movements of her arms and legs. So when she walked her arms, legs and head were waving around uncontrollably. It was scary at first until I started talking to her. To think I was feeling sorry for myself! Turned out I was in for two weeks total, and, another week of daily visits to get my intravenous antibiotic. But still the pain has only subsided a little. Thankfully, the movement of my arm returned after a few days, whew. The doctors said, as I checked-out that they hoped not to see me again, but that it would probably be three more months before I was “normal” again. They were right, as it turned out. On to a Neurology specialist, Chinese acupuncture and herbs, Qigong and physical therapy and a strict, organic only, diet after extensive in-depth Lyme Disease research. I managed to finish and record the film score without delaying production. Featured lot’s of trombone playing. Sometimes as many as five overdubbed. Playing the trombone was painful because of the nerve damage in all my breathing, except the most vital, muscles in the diaphragm area but I managed to do it. Most of the trombone breathing muscles were not functioning due to the nerve damage, so I had retrain myself to breathe with the few muscles that were still available. Didn’t tell the director I was sick until after we finished. He was very happy with everything. The film is called “Yes, And…” Hopefully will come out this year. Of course it’s a romantic comedy. A horror sci fi would have been more appropriate for my situation. Now, about five months after the beginning of the pain, I’m 99% back to normal. Whatever normal is. About two weeks ago it was like the fog (of disease) lifted, it was quite a sensation, like everything got clearer all of a sudden. Still doing Qigong and trying to eat only organic food as much as possible. The pain is gone. It’s great to be back! Thanks for reading. Please visit my web site, www.edneumeister.com and let me know what you think. Ed I’m here for the music. Just coming off a busy month of tours and gigs, all great, as it turns out. Early December was the Netherlands tour. I spent in week in the Netherlands as a guest with a couple different bands and schools. Then a 3 day “Portrait” at the great jazz club in Vienna, Porgy & Bess. Three nights, three different bands, three different kinds of music. Whew!! Fun!! Started in Enchede where I played a concert with the Millennium Jazz Orchestra, a quartet concert with some of the teachers from the conservatory and a concert with some of the students. The concert with the Millennium Jazz Orchestra led my Joan Reinders went very well. Then band played my music great and were enjoyable to work with. Joan conducted (which I often do as well) so all I had to do was show up and play. I did conduct Jari, one of the pieces I didn’t play on. Unfortunately, it was extremely cold with icy snow on the ground and an icy wind blowing so the size of the audience wasn’t as large as we would like. Those that were there were quite enthusiastic. The quartet concert with some of the teachers was also great. There are all great players and very sympathetic. With no rehearsal we picked some tunes and played. Felt like we had played together for years (oh, they have…) really fun. The concert with the students went well, more challenging for me, of course. Sometimes I felt as if I was pulling a train. But, it’s important to play together with students so that they can get the experience of playing with experienced players. Next, off to Utrect to play with the Frits Bayens Big Band. Frits is an old friend and colleague. As a producer for the Metropole Radio Orchestra he commissioned me to write and come as soloist for several projects over the years. He’s also a great arranger himself and we played many of his charts with his band, which has been together for 30 years. This was an interesting gig for me as I was the featured soloist on every piece and the only rehearsal we had was a quick run-through at the sound-check. Fun. The next morning I was at the conservatory in Rotterdam for some composition lessons, trombone clinics and master-classes. A cool week, especially as it was below freezing and snowing the whole week. Made for some interesting travel days. The big news, really was the Suite Ellington project and the three day “Portrait” at the great club Porgy & Bess in Vienna. The Suite Ellington Project: Billy Drewes-Alto Sax & Clarinet, Jim Rotondi-Trumpet & Flugelhorn, Fritz Pauer-piano, Peter Herbert-bass & Jeff Ballard was put together to perform my arrangements of some of the more obscure Ellington and Strayhorn. Mostly from their Extended Suites, such as Black Brown & Beige, Far East Suite, Afro Eurasian Suite and the complete Queens Suite. We started in Graz where the guys who are not associated with the University, Billy Drewes, Jeff Ballard, Peter Herbert & Fritz Pauer (who made his first return visit since retiring from teaching a few years ago) all gave clinics, workshops and master-classes. We started with an open rehearsal. All the students were invited to attend and the room was full. I think it’s important for the students to see how a high level professional rehearsal is run. We ran through everything, made sure the road maps made sense and played most everything a couple times, so that we could all become accustom to how our part fit into the whole. With three horns, in order to get some variety of colors the lead sometimes moves from player to player. Of course, you need to know where you are in the formation in order to make the proper blend. The next morning started with workshops on the prospective instruments, Billy with the saxes, Jeff with the drummers etc,. End the evening we played the concert at the Orpheum in Graz. Great concert! What can I say? The guys played my arrangements, which are sometimes quite twisted and other times more of an orchestrated transcription, with precision and passion. It’s such a great pleasure to hear ones compositions and arrangements played by the highest-level players. After the Orpheum concert in Graz we then moved to Vienna for the beginning of the three-day Portrait. It was generous of Christoph Huber to offer me this Portrait and let me design the three days any way I wanted. Consequently, I wanted to do three completely different programs. Suite Ellington focusing on my arrangements, Chamber in the Now focusing on improvisation, or, composing in the moment, and thirdly the music for big band. It was a great opportunity to present my music, which is admittedly somewhat Schizophrenic, in a concentrated time. The one style, I left out is the one that I am most known for, Modern Mainstream, or, whatever you call it? ?